Bargain shoppers save on brand-name fashion labels at the factory stores in the Designer Outlet Soltau village mall between Hamburg and Hannover in Germany. The outlet is directly off the autobahn A7 (exit Soltau Ost) making it an easy stop over to pick up bargains on designer clothes when traveling in northern Germany. The factory stores in the outlet village take the region into account making it a great mall for buying wind and waterproof jackets and outdoor clothing. It also has several home wear stores with such famous German brands as WMF, Krups and Auerhahn selling practical household and kitchen items that also make practical souvenirs from Germany. The Steiff outlet sells quality toys. Designer Outlet Soltau offers bargain hunters 30 to 70% discounts on name-brand fashion of a variety of top European and international labels. Around a hundred factory outlet boutiques here sell mostly clothes but also shoes, accessories, and home wear. As with other outlet malls, the clothes on offer are mostly overstocked or previous season items. The way the fashion industry calendar works, this may often give shoppers the change to buy summer clothes in summer rather than in spring. Very few items are factory rejects and usually marked as B-ware. 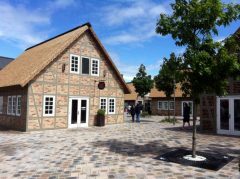 The Designer Outlet Soltau follows the typical Germany factory mall store concept with shops in a village-type layout mixing modern architecture with faux regional-style heath cottages. It all looks very pretty although on a rainy day shoppers still get wet running between the different shops – at least it is a traffic free village so no need to look out for cars. Non-European residents may use the Tax-Free Shopping Service – enquire at any store on the procedure that must be followed. Paying by credit card usually makes the refund when departing from Europe easiest. Some of the famous clothing and shoe brands at Soltau include Baldessarini, Bench, Begans of Norway, Brax, Camel Active, Club of Gents, Crocs, Daniel Hechter, Desigual, Esprit, Fossil, Gant, Gerry Weber, Hunkemöller, Jack & Jones, Kaiser, Liebeskind Berlin, Marc O’Polo, Mexx, Mey, Quicksilver, Sterntaler, Tom Tailor, Vero Moda and Zucchi. Several upmarket accessory labels also have stores at Soltau. A large number of watch brands are sold including Armani, Diesel, DKNY, Karl Lagerfeld, Marc by Marc Jacobs, Maurice Lacroix, Michael Kors, Michel Herbelin. Sunglasses are available from Carrera Eyewear, Oakley, Prada and Ray Ban. Bags and suitcases are available from several shops but serious shoppers may visit American Tourister and Samsonite for further bargains on traditional luggage. Home wear and non-fashion factory stores are also present at Soltau including brands such as Alfi, Auerhahn, Home & Cook, Krups, Laura Ashley Home, Le Creuset, Moulinex, Möve, Rowenta, Tefal and WMF. Some of these items make beautiful and useful souvenirs from Germany. Children will enjoy the play area or some gifts from toymaker Steiff. Designer Outlet Soltau has several eating options taking into account that some shoppers simply want to eat and go while other may want to sit down and relax for a while. Asian food – sit-down or take-out is available from Asiahung. For coffee and snacks, try Starbucks, Amorino or Il Cappucino. The opening hours of Designer Outlet Soltau is Monday to Saturday from 10 am to 8 pm. The mall is closed on Sundays. Getting to the Designer Outlet Soltau is easiest by car although the Flixbus MeinFernbus inter-city buses and trains offer public transportation options. The factory shopping mall is just off the Soltau Ost exit on the Autobahn A7. Driving time is around 40 minutes from Hamburg and an hour from Hannover. If arriving from Celle with its beautiful half-timbered town center, use the B3. Driving is by far the more sensible way to arrive at Soltau. As a result, plenty of free parking is available at the center. 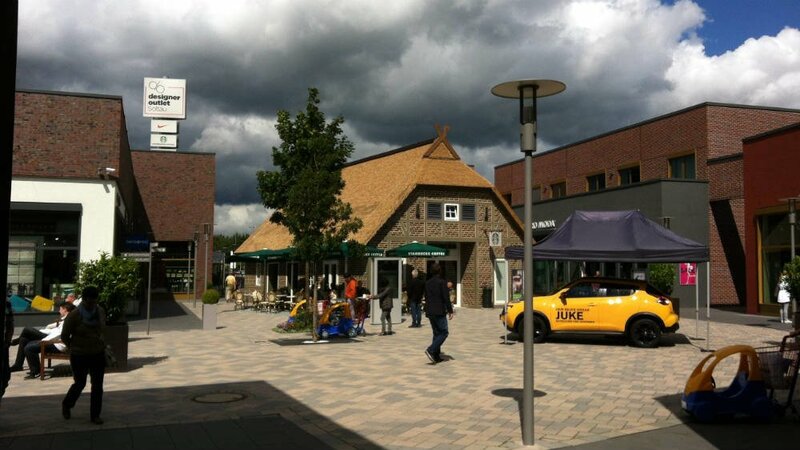 The address is Designer Outlet Soltau, Rahrsberg 7, 29614 Soltau. (GPS Sat Navs without Rahrsberg could use Wietzendorfer Straße 6. Signposting is clear from the Autobahn exit. It is also possible to reach Soltau outlet mall by direct Flixbus MeinFernbus long-distance intercity buses from Hamburg and Hannover. The buses stop directly at the shopping center – show the bus ticket at the service center for discount and free coffee vouchers. Trains from Hamburg, Hanover and Bremen also frequently stop at Bahnhof Soltau. From here, bus 305 and 355 run to the shopping mall (but not during school holidays!). Travelers arriving by train may phone for a taxi (only €2.50) around 20 minutes before arriving at the station at 0171-286-5099 – the level of English may depend on whoever answers the phone on a given day. 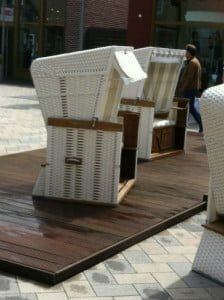 Designer Outlet Soltau offers shoppers great bargains but as with all factory stores the selection very much depends on the specific day and season. The mall is a popular stop for travelers from Scandinavia en route to and from southern Europe making it a great place to buy rain and windproof clothes. Savings are even bigger during the frequent sales – July and January usually offer the best deals.